The New Smyrna Beach Jazz Festival is one of Central Florida’s premier music events. It is a lively three day affair with great jazz, good food and lots of fun. Flagler Avenue has proven to be the perfect location, with concert goers going from club to club all day from the Atlantic Ocean to the Indian River. 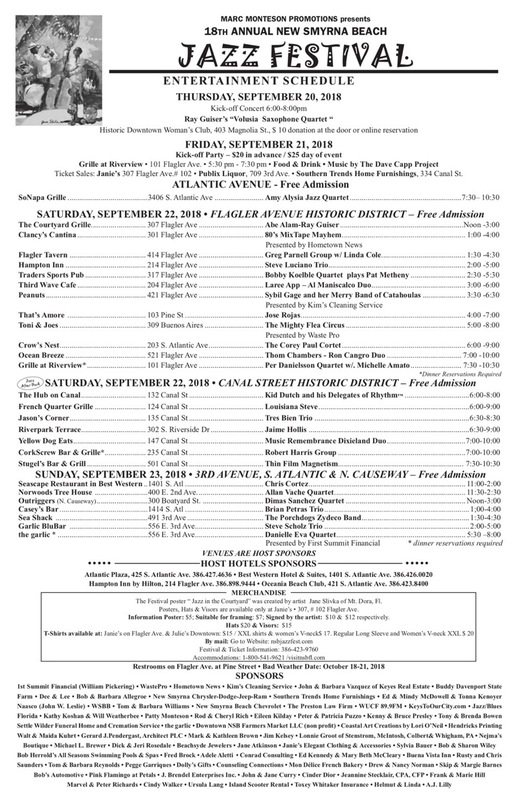 Through the years the festival has expanded to include Third Avenue, Canal Street, Atlantic Avenue and the North Causeway in New Smyrna Beach. The first event was in September of 2001. It began when founder, Marc Monteson took action on an idea the Merchants of Flagler Association had for creating an event to help bring traffic to local businesses during the slow time of the year. By 2014, the festival had grown to 24 venues hosting visitors from 10 states and featuring top name jazz musicians from all over including New Smyrna’s own, the late Harold Blanchard. Several jazz festivals were dedicated to deceased musicians who played at the the festival or were sponsors of the event— including Ronnie Jones (2002), Nathen Page (2003), Noble “Thin Man” Watts (2004), Tim Probst (2007), Christa Kelsey, sponsor (2010), Harold Blanchard (2011), Joe Mose & Bobby Branca (2012), George West (2013), Jennie Monteson, Bruce Presley, Joe Adamik, and Bob Garriques, sponsors (2014), John Hostetter ( 2016) and Fran Bremer, Dave Fernandez, Larry Coryell, Ken Mina, Marylyn Shaw ( 2017). .
Jazz was first introduced to the ’Avenue’ in the form of ‘Jazz It Up On Flagler Avenue’ in January, 2000. It was a series of bi-monthly concerts at the Gazebo, at the corner of Pine and Flagler. This event was spear-headed by John and Barbara Vazquez, Anthony Bell and Dave Fernandez. The first two concerts featured Acousticon and Don Nedobeck. After these two shows, Marc was brought in to book some concerts that included Mark Hodgson with Noble ”Thin Man” Watts, Thom Chambers, Lawrence App and Sal Ronci with Linda Cole. 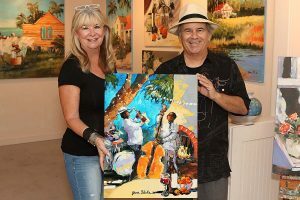 Flagler Avenue artist Samuel Ruder donated his Jazz Boat piece that was used on posters and T-shirts. That same design went on the first two New Smyrna Beach Jazz Festival posters and T-shirts. ‘Jazz It Up On Flagler Avenue’ ran until April of 2002. Today, the New Smyrna Beach Jazz Festival has become a top-notch weekend musical event with help from many private and public donations, several local volunteers for the festival weekend and the dedication of Marc Monteson.